You can use the Digital Filter Design block to design and implement a digital filter. The filter you design can filter single-channel or multichannel signals. The Digital Filter Design block is ideal for simulating the numerical behavior of your filter on a floating-point system, such as a personal computer or DSP chip. You can use the Simulink® Coder™ product to generate C code from your filter block. You perform all filter design and analysis within the filter designer app, which opens when you double-click the Digital Filter Design block. Filter designer provides extensive filter design parameters and analysis tools such as pole-zero and impulse response plots. Once you have designed your filter using filter designer, the block automatically realizes the filter using the filter structure you specify. You can then use the block to filter signals in your model. You can also fine-tune the filter by changing the filter specification parameters during a simulation. The outputs of the Digital Filter Design block numerically match the outputs of the equivalent filter System object™, when you pass the same input. The Digital Filter Design block allows you to save the filters you design, export filters (to the MATLAB® workspace, MAT-files, etc. ), and import filters designed elsewhere. To learn how to save your filter designs, see Saving and Opening Filter Design Sessions. To learn how to import and export your filter designs, see Import and Export Quantized Filters. You can use the Digital Filter Design block to design and implement a filter. To implement a pre-designed filter, use the Discrete FIR Filter or Biquad Filter blocks. Both methods implement a filter design in the same manner and have the same behavior during simulation and code generation. See the Digital Filter Design block reference page for more information. For information on choosing between the Digital Filter Design block and the Filter Realization Wizard, see Select a Filter Design Block. This section explains the similarities and differences between the Digital Filter Design and Filter Realization Wizard blocks. Filter design and analysis options — Both blocks use the filter designer app for filter design and analysis. Output values — If the output of both blocks is double-precision floating point, single-precision floating point, or fixed point, the output values of both blocks numerically match the output values of the equivalent System objects, when you pass the same input. Supported filter structures — Both blocks support many of the same basic filter structures, but the Filter Realization Wizard supports more structures than the Digital Filter Design block. This is because the block can implement filters using Sum, Gain, and Delay blocks. See the Filter Realization Wizard and Digital Filter Design block reference pages for a list of all the structures they support. Data type support — The Filter Realization Wizard block supports single- and double-precision floating-point computation for all filter structures and fixed-point computation for some filter structures. The Digital Filter Design block only supports single- and double-precision floating-point computation. Block versus Wizard — The Digital Filter Design block is the filter itself, but the Filter Realization Wizard block just enables you to create new filters and put them in an existing model. Thus, the Filter Realization Wizard is not a block that processes data in your model, it is a wizard that generates filter blocks (or subsystems) which you can then use to process data in your model. The following are specific situations where only the Digital Filter Design block or the Filter Realization Wizard is appropriate. Use to simulate single- and double-precision floating-point filters. Use to generate highly optimized ANSI® C code that implements floating-point filters for embedded systems. Use to simulate numerical behavior of fixed-point filters in a DSP chip, a field-programmable gate array (FPGA), or an application-specific integrated circuit (ASIC). Use to simulate single- and double-precision floating-point filters with structures that the Digital Filter Design block does not support. Use to visualize the filter structure, as the block can build the filter from Sum, Gain, and Delay blocks. Use to rapidly generate multiple filter blocks. See Filter Realization Wizard and the Filter Realization Wizard block reference page for information. Open Simulink and create a new model file. 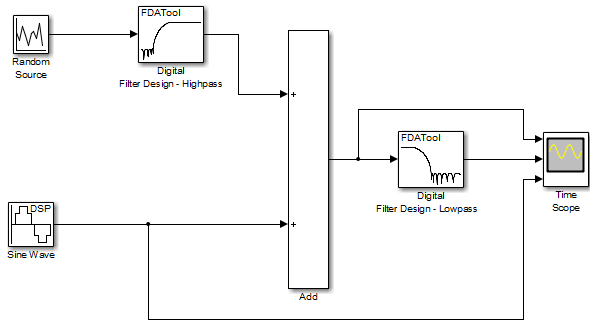 From the DSP System Toolbox™ Filtering library, and then from the Filter Implementations library, click-and-drag a Digital Filter Design block into your model. Double-click the Digital Filter Design block. The filter designer app opens. Click Design Filter at the bottom of the app to design the filter. Your Digital Filter Design block now represents a filter with the parameters you specified. From the Edit menu, select Convert Structure. The Convert Structure dialog box opens. Select Direct-Form FIR Transposed and click OK.
Rename your block Digital Filter Design - Lowpass. The Digital Filter Design block now represents a lowpass filter with a Direct-Form FIR Transposed structure. The filter passes all frequencies up to 20% of the Nyquist frequency (half the sampling frequency), and stops frequencies greater than or equal to 50% of the Nyquist frequency as defined by the wpass and wstop parameters. In the next topic, Create a Highpass Filter in Simulink, you use a Digital Filter Design block to create a highpass filter. For more information about implementing a pre-designed filter, see Digital Filter Implementations. From the DSP System Toolbox Filtering library, and then from the Filter Implementations library, click-and-drag a second Digital Filter Design block into your model. Click the Design Filter button at the bottom of the app to design the filter. In the Edit menu, select Convert Structure. Rename your block Digital Filter Design - Highpass . The block now implements a highpass filter with a direct form FIR transpose structure. The filter passes all frequencies greater than or equal to 50% of the Nyquist frequency (half the sampling frequency), and stops frequencies less than or equal to 20% of the Nyquist frequency as defined by the wpass and wstop parameters. This highpass filter is the opposite of the lowpass filter described in Create a Lowpass Filter in Simulink. The highpass filter passes the frequencies stopped by the lowpass filter, and stops the frequencies passed by the lowpass filter. In the next topic, Filter High-Frequency Noise in Simulink, you use these Digital Filter Design blocks to create a model capable of removing high frequency noise from a signal. For more information about implementing a pre-designed filter, see Digital Filter Implementations. Click-and-drag the following blocks into your model. Set the parameters for these blocks as indicated in the following table. Leave the parameters not listed in the table at their default settings. Connect the blocks as shown in the following figure. You might need to resize some of the blocks to accomplish this task. From the Simulation menu, select Model Configuration Parameters. The Configuration Parameters dialog box opens. In the model window, from the Simulation menu, choose Run. 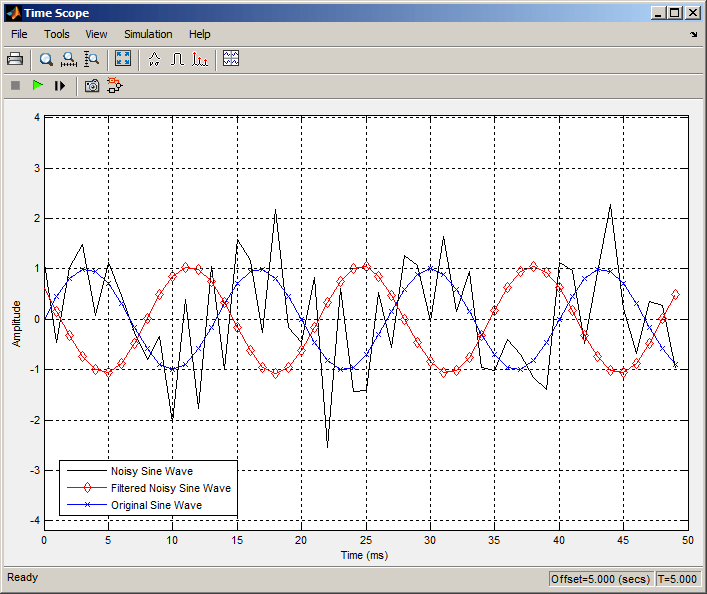 The model simulation begins and the scope displays the three input signals. In the next step, you will set the color, style, and marker of each channel. You can see that the lowpass filter filters out the high-frequency noise in the noisy sine wave. You have now used Digital Filter Design blocks to build a model that removes high frequency noise from a signal. For more information about these blocks, see the Digital Filter Design block reference page. For information on another block capable of designing and implementing filters, see Filter Realization Wizard. To learn how to save your filter designs, see Saving and Opening Filter Design Sessions. To learn how to import and export your filter designs, see Import and Export Quantized Filters.